Although Gorsuch has never ruled on abortion rights, his opinions on contraception and assisted suicide signal he opposes it. Gorsuch, a federal judge on the 10th U.S. Circuit Court of Appeals for a decade, was nominated by President Trump to fill a vacancy left by the unexpected death of conservative Judge Antonin Scalia nearly a year ago and still vacant because Republicans blocked then-President Barack Obama's nominee. 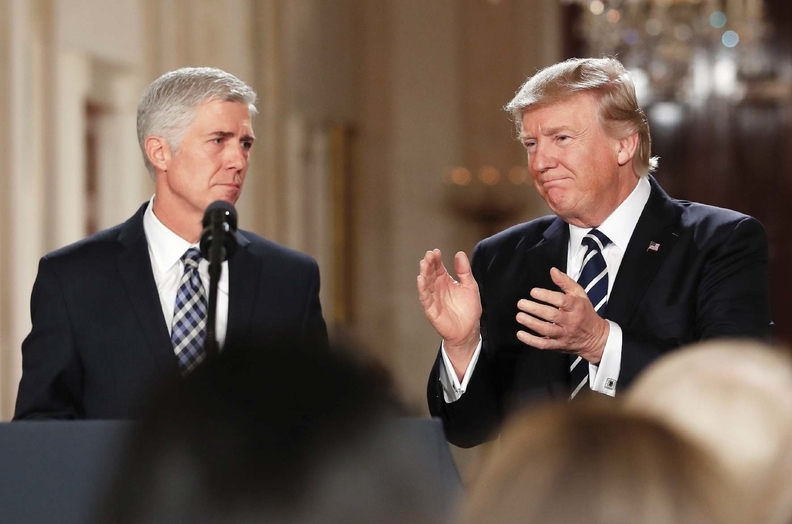 If Gorsuch's nomination is approved, the majority of justices on the court will have been appointed by Republican presidents. Right now the court is split 4-4. Senate Democrats have signaled they will filibuster the nomination to force the GOP to come up with 60 votes to confirm him. Trump has encouraged Majority Leader Mitch McConnell to “go nuclear” and eliminate the 60-vote threshold. Gorsuch sided with Hobby Lobby in a 2013 suit against the HHS claiming the company shouldn't be required to cover contraception as part of their employer-sponsored health plans because that would be in conflict with the religious beliefs of the company's founders. The Supreme Court eventually ruled 5-4 in favor of Hobby Lobby. President Trump publicly said on the campaign trail he will nominate a candidate that supports overturning Roe v. Wade. Neil Gorsuch's vote on the Supreme Court could be decisive in healthcare litigation likely to arise as Republicans dismantle the Affordable Care Act. But even if Greenberger is right, Gorsuch's vote probably wouldn't be enough to dismantle Roe v. Wade. In a 5-3 decision last June the court struck down a Texas law that limited women's access to abortion procedures. Justice Anthony Kennedy, who was nominated by Republican President Ronald Reagan, ruled in favor of abortion access in that case. But Gorsuch could still sway the court's votes on related matters. Several states have passed measures that limit access to abortions, and some may end up in front of the Supreme Court, and Kennedy doesn't consistently vote in favor of abortion rights, Greenberger said. Question: Whether nursing homes' use of arbitration agreements is valid. A Kindred subsidiary claims federal law allows them to use the provision to avoid litigation. Scheduled for arguments Feb. 22. Question:Whether insurers can recoup costs from their federal employee planholders' personal injury settlements. Scheduled for arguments March 1. Question: Whether an exemption to the Employee Retirement Income Security Act of 1974 available to church pension plans applies to faith-based hospitals and other church-affiliated employers. Scheduled for arguments March 27. Question: How to resolve patent disputes involving biosimilar licensing—specifically, whether a biosimilar manufacturer applying for FDA clearance must provide information about its process to the maker of the incumbent drug. Not yet scheduled for arguments. Question: Whether EHR giant Epic's policy to require employees to submit labor disputes to arbitration violates federal labor laws. Not yet scheduled for arguments. Medical aid-in-dying is now legal in six states. The Supreme Court hasn't ruled on the matter and has referred the issue to the states. The imminent repeal of the ACA also places greater importance on the Supreme Court. Four cases involving the law have already reached the Supreme Court, and legislation repealing it and replacing it is likely to spur more litigation that could end up there. Trump may well have opportunities to fill more seats. Two members of the court's liberal wing—Justices Ruth Bader Ginsburg, 83, and Stephen Breyer, 78—as well as swing voter Kennedy, 80, may contemplate retirement soon.